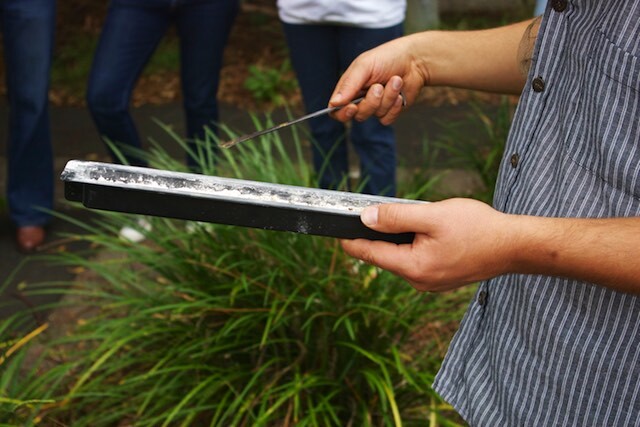 Here’s a few photos from our Autumn Natural Beekeeping course in Sydney, and some resources for you to be reading over Winter. 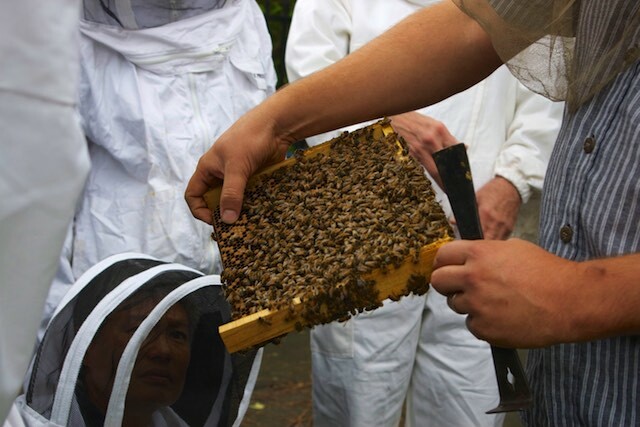 These shots are from opening a hive that Adam Kennedy, who hosts our Natural Beekeeping courses, caught as a swarm and housed in a Warré hive box – go Adam! The bees are now happily working away, and as you can see from the pics below, they’re pretty darn healthy and happy in their new home. 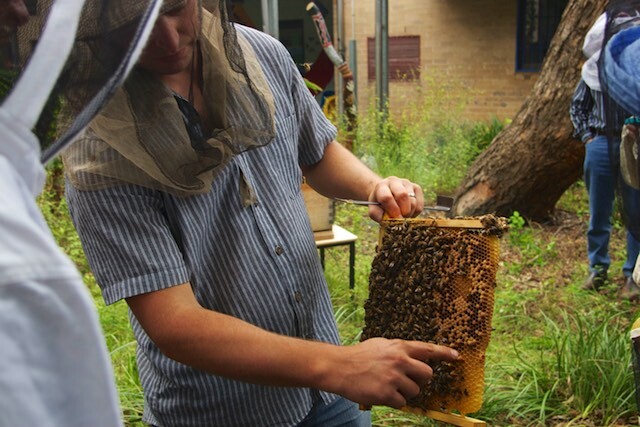 As always, Tim Malfroy was able to show the students first hand how the queen lays in a Warré hive, as in this hive design she’s free to roam as she likes. The brood look healthy and the colony has got a good thermal dome of honey above them already, which they will increase before winter for food, and overall colony health. Come springtime, there should be plenty of honey left over to harvest from this hive, but we’ll wait and see what the bees end up needing to see them through the cold months first. 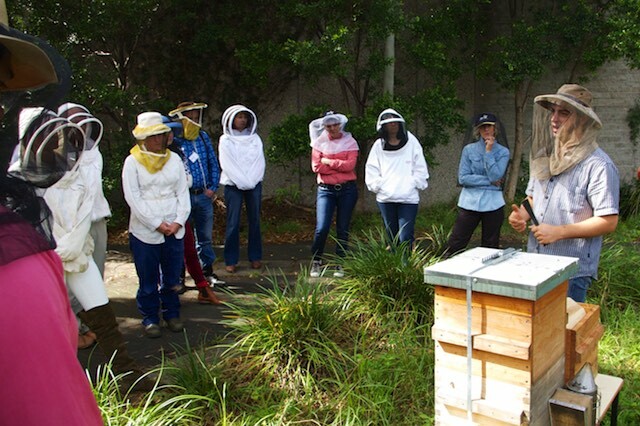 By harvesting in Springtime, we’ll be harvesting the excess honey that the bees don’t need to keep their colony fed, as things will be a-blooming once more – especially in Sydney, where this course (and this hive) is held. 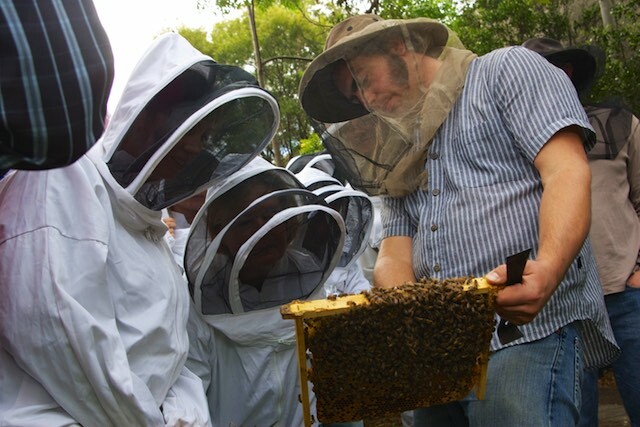 That’s what bee-centric beekeeping, like Warré Beekeeping, is all about. 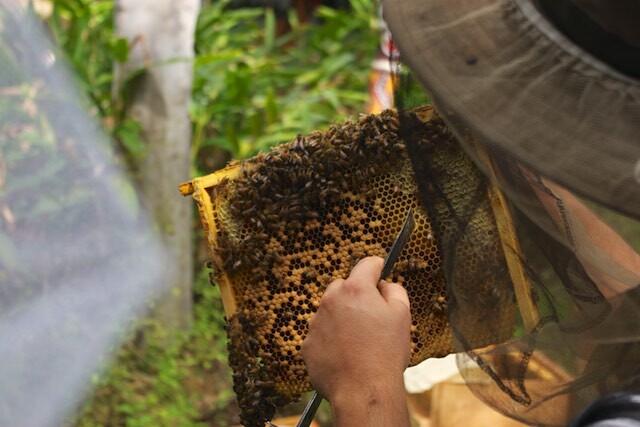 Harvesting the excess honey, rather than what the bees might need. 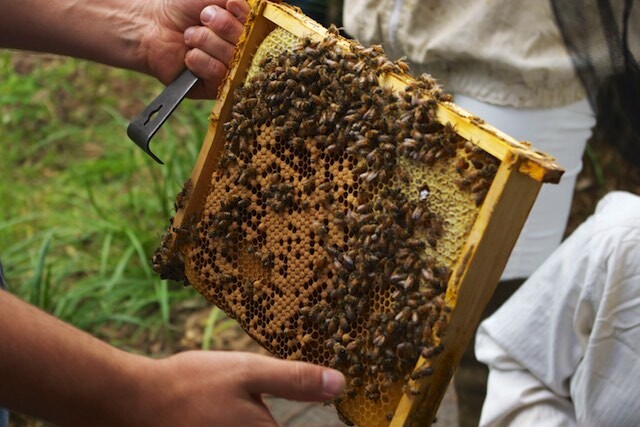 Less stress for bees means more pollinators for all of us. 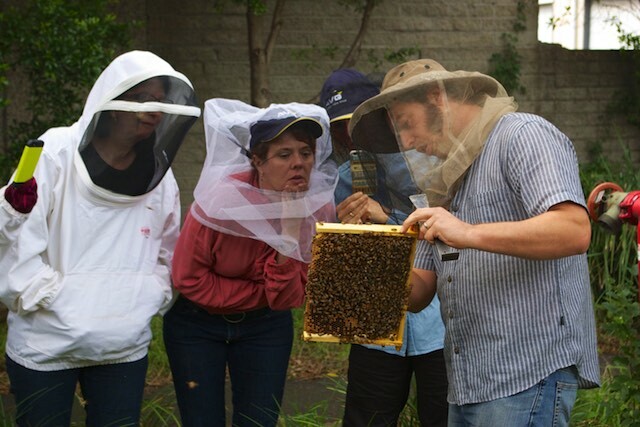 Thanks for showing us your homes to all the bees who came along to each Natural Beekeeping course this season! 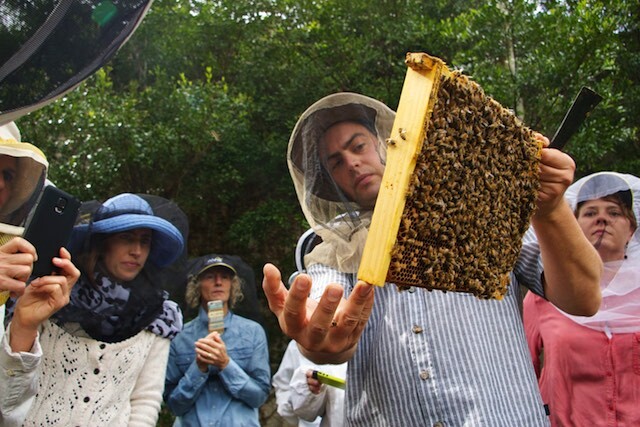 Many future Natural Beekeepers appreciate your efforts. 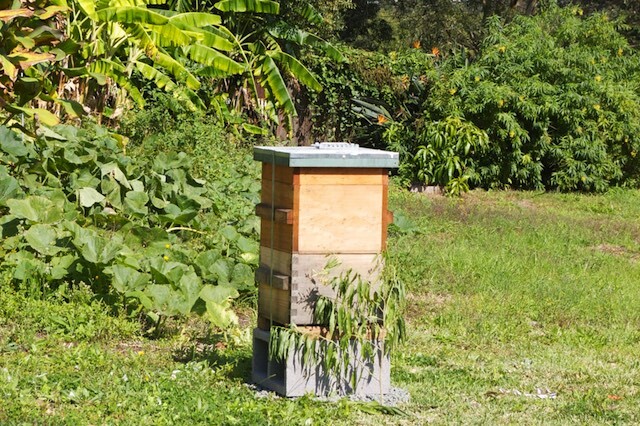 At this time of year its time to pack down your hives and let then rest easy over Winter. Here’s some winter reading for you to be going on with until the season begins again. 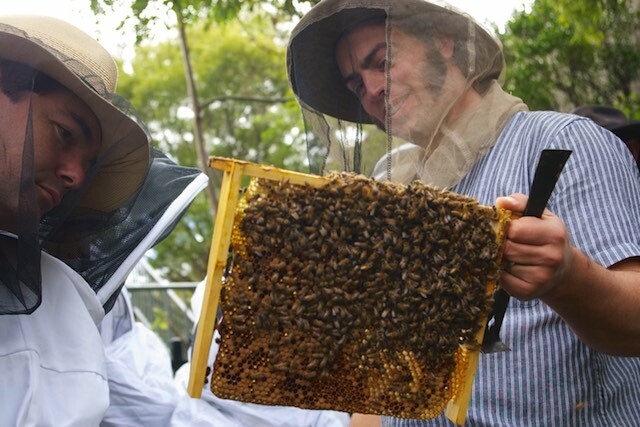 Big thanks to Tim Malfroy (who is Australia’s only professional Warré Beekeeper, by the way. Nice title, that.) for leading the learning, and to Adam Kennedy for the photos + his ongoing hosting/beekeeping goodness. And home the hive went, to sit in a secret vacant lot near Adam’s home, in a protected sunny spot to see Winter through, undisturbed. Thanks for everything, bees. a question: my neighbour has found a tiny colony in his attic and we have an empty top bar hive::how do we move the colony into the hive? … any tips/ideas/how to’s would be awesome, thanks! Hmm interesting! I would leave them along till August at the earliest, and see if they’re still there. How you remove them depends on exactly how they’re setup. 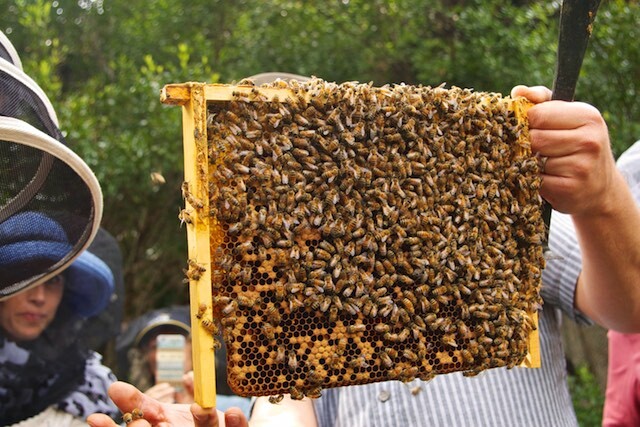 You *could* try setting up the top bar hive next to them in the attic in the meantime, and rubbing lemon balm inside the hive to encourage them to shift house. 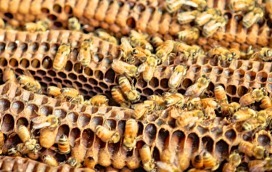 thanks for writing . . . . i’m in the u.s where we just had summer solstice 🙂 they’ve only just setup their colony, and i believe there’s a bit of comb they’ve worked on since moving into his attic about 3 weeks ago. . . . what do you think about cutting the comb off where it’s attached, putting it in a box bees and all , then moving them into the tbh?? would they restart, and would using a smoker be advisable? . . .his attics too small to fit the whole hive into . . .
Look up “hive cut-out” on youtube and watch as many videos as you can. As it’s Summer for you so there’s no reason to delay, I’d suggest doing the cut-out as soon as possible, before the hive gets any bigger and more established. I don’t think this is possible with topbar frames, but if you use Langstroth (or Langstroth-like) frames, you can make a hammock in the frame with elastic bands and nails for anchoring and use this to rest the cut-out comb in. 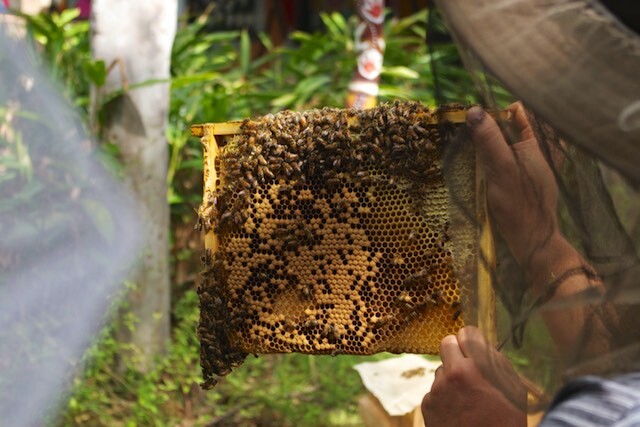 If things go well, the bees will over time build the comb so that it sits in the frame on its own, and at that point they’ll chew apart the elastic bands and remove them from the hive. ahso! interesting idea this:: hammocking. thanks! It wouldn’t be to everyone’s taste but my winter reading has included The Song of Increase by Jacqueline Freeman. Thanks for great stack of things to read! Hmm haven’t come across that one – thanks! Seeing those photos made me wonder about the pros and cons of painting hives. We are planning to paint our new hives to make them last, but it looks like your hives are unpainted. Do you find that they last well and don’t get mouldy? 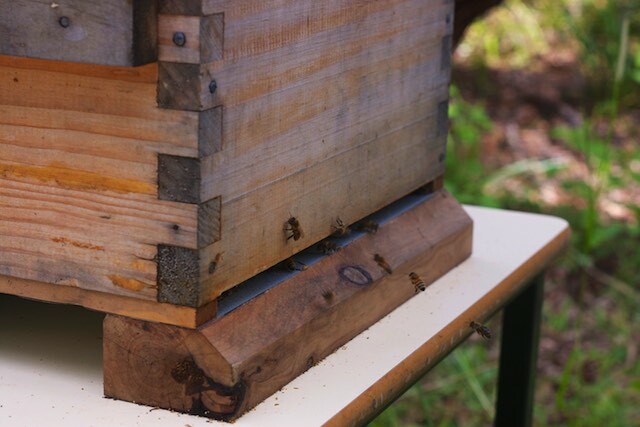 these hives are painted with a hot mixture of beeswax + linseed oil – they weather great while being as non-toxic and bee-friendly as you can get. Re-painting every 5 years or so is a good idea. Also, Tim Malfroy makes all his boxes from Mountain Ash, a local hardwood eucalypt, so they’re very durable. 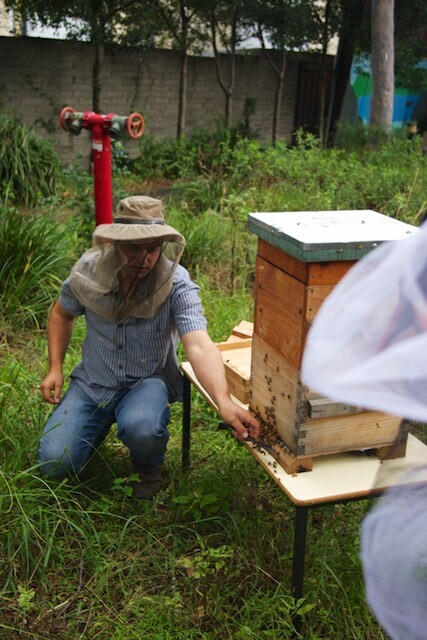 The hives Tim sells during the course are made from Golden Cyprus ( Cupressusus macrocarpa) This timber has large amount of natural preservative in it along with oiling the box (as above ). If you are making yours from Radiata Pine then can use natural paint or low toxicity paint (on outside).